The third installment of a trilogy is typically the most satisfying. The Empire Falls, Frodo destroys the ring, Cinderella goes back in time. (Okay, that's a stretch.) Our protagonist in this tale is the Droid 3, which bears an uncanny resemblance to its dad and granddad-- but Motorola's added a few new components and made some minor design tweaks in attempt to improve the overall experience. How would you rate the DROID 3? As mentioned earlier, the Droid 3 is a spitting image of its predecessors: the same large, boxy body, the lower lip extending out from the rest of the phone, as well as that full QWERTY keyboard. But upon closer inspection we found more than a few cosmetic differences. Dimensionally, the latest rendition may be the thinnest of the bunch at just a hair under 13mm (compared to 14mm and 13.7mm for the first two Droids, respectively), but it's also the largest. While the first two Droid generations had mid-sized 3.7-inch (480 x 854) LCD displays, this one steps up to a gorgeous 4-inch qHD screen. The bezels on the Droid 3 are thicker and larger on all sides, which unfortunately adds unnecessary heft. Consequently, the device is also the heaviest of the series, weighing in at 6.49 ounces (184g) compared to 5.96 ounces and 6.0 ounces. As the Droids have always been a rather gravity-loving group, an extra half ounce amounts to a relatively minor add-on. Being as relatively heavy as it is, you may be tempted to think this is a rock-solid phone with no durability concerns at all -- and you'd be right. Motorola fashioned its latest device out of polished metal on the sides and rubberized plastic on the back to make for a more comfortable, firm grip. The screen's also covered with Gorilla Glass for scratch protection. All told, that added depth makes the Droid 3 easier to grasp, though the larger size regrettably makes it annoying to hold onto for long periods of time. A defining feature of the three Droids is the lower lip that protrudes from the rest of the phone. This cosmetic landmark is a result of making the bottom half of the handset -- the keyboard half -- just a little longer than the top half. Not only does this contribute to the phone's elegant look and feel, it also makes room for a larger keyboard. Sadly, there isn't much else about the Droid 3 that exudes grace or luxury; gone are the gold accents adorning the original, as well as the chrome detailing and light blue tint on the second. What we are left with otherwise is a plain boxy phone with the standard keys. There's nothing new or innovative here. Apart from that, the newest Droid has made some layout tweaks over the last version. It adds an HDMI port next to the microUSB charger on the left side, swaps the power button and 3.5mm headphone jack up top, and has a slightly retooled volume rocker on the right side. On the back we see a pop-off battery cover (which, by the way, can be substituted for an inductive wireless charging cover, if you prefer), 8 MP shooter with LED flash, and a speaker grill and mic hanging out near the bottom. Underneath the hood lies a SIM card matching the Droid 3's international roaming capabilities, as well as a slot for the microSD. Alas, the phone doesn't come with a memory card, though Motorola at least provides us with 16GB of internal storage -- enough to hold a fair number of apps and multimedia files. If this isn't enough, the handset supports an additional 32GB of external storage, bringing the total of 48GB. This is an obvious improvement over the 8GB that came standard with the last-gen Droid 2. Lastly, there are a few significant improvements in the internal hardware department. 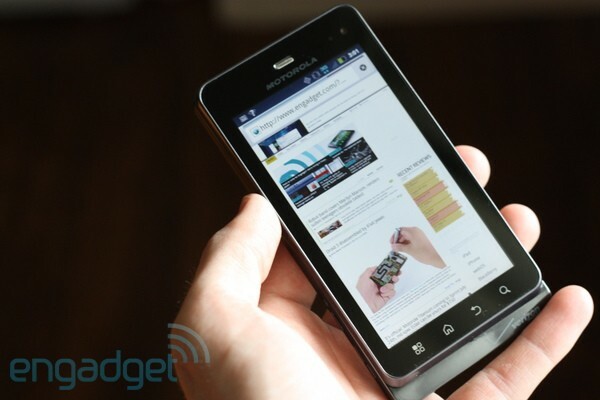 The Droid 3 houses a 1GHz dual-core TI OMAP4430 processor, 512MB RAM, and a 1540mAh battery (more on that later). Finally, it adds a VGA front-facing camera, while the rear camera got a bump to 8 megapixels. The only thing spec-wise that we would've really appreciated was an LTE radio for superfast broadband access. Riches and glory could be showered upon the Droid 3 as the first full QWERTY on Verizon's 4G network; without it, however, its success can't be so easily written in stone. Having a full QWERTY device capable of working on Verizon's 4G network could potentially become a large success, given the lack of variety we've seen in Big Red's lineup thus far. Speaking of improvements, the keyboard is the area Motorola appeared to focus on the most. The Droid 2's board, while better than the original by a country mile, still left plenty of room for improvement. 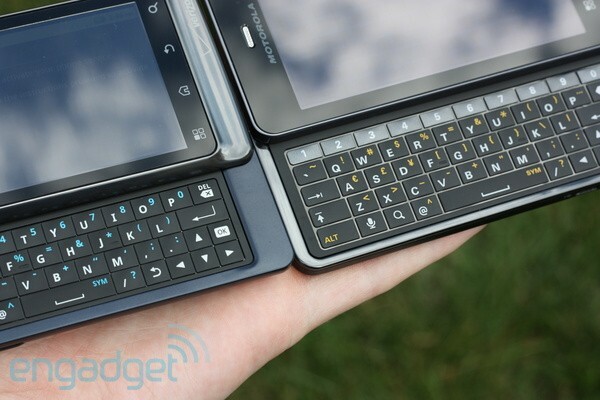 Interestingly, the current model steps up by splitting the difference between those two keyboards. For instance, the keys aren't as bouncy or rubbery, but they also aren't flat. It's actually the perfect balance of give and clickiness -- the keys feel natural to type on, and we didn't experience any learning curve, making it a decided improvement over the Droid 2. The sliding mechanism's a bit stiff, though usable; if given the choice we'd rather have it err on the side of solid as opposed to flimsy. We also applaud HelloMoto for including a row of dedicated number keys. It's a major frustration for us when companies omit this from QWERTY keyboards, since it throws off our "typing groove" -- having to stop mid-sentence to hunt down the ALT or Fn keys and manually enter each number really breaks up the flow. Motorola also seemed to learn its lesson from the debacle that was the original Droid's direction pad, as it was retooled for the second-gen devices and remains in tact this time around. The d-pad is much smaller and relegated to the lower right corner of the keyboard, which leaves enough room to make every individual key larger and easier to press. The keys are also backlit, which makes it a great deal easier to text and email at night or in a darkened room. This is infinitely better than being forced to use the onscreen keyboard in order to see what we're writing. With that said, however, the virtual version of the 'board is still a breeze to use. On top of the default Moto keyboard, the Droid 3 comes with Swype pre-installed as an option. We understand that many people have love-hate relationships with Swype, and much of it depends on its accuracy; on this device, however, we felt it handled our need for typing speed well, with few incorrect guesses. The Droid 3's camera sounds great, right? An 8 megapixel shooter with 1080p video capture shouldn't be anything to bicker about on a high-end smartphone. 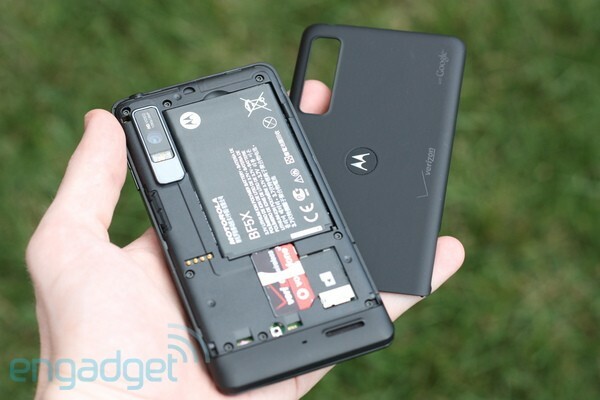 Problem is, it's not all about megapixel count -- and it doesn't work in Moto's favor here. It was disappointing to find that the dedicated camera button, proudly emblazoned on the right side of both previous Droids, has mysteriously disappeared -- much like with the Droid X2. We understand that a dedicated camera button might not work for skinnier handsets, but there's more than enough heft on the Droid 3 to allow a spot for it. Worse still, there was also no ability to manually adjust contrast or exposure to our own liking. We also encountered issues with the camera software itself. On more than one occasion the viewfinder froze. Usually, the bug would resolve itself as soon as we switched over to video mode and back again. We even had some problems getting the camera app to initialize, which we resolved by restarting the phone. More often than not, the camera would take its sweet time focusing -- especially in low light. As a result, we weren't able to catch a whole lot of impromptu moments. Once we were able to make it through a full photo session using the camera, the images turned out to be mediocre -- they definitely weren't up on par with comparable smartphones such as the Samsung Galaxy S II. Colors were slightly washed out in bright daylight and ill-defined under overcast conditions, with objects appearing shadowy in low light. In testing the video, we found that movements generally appear smooth. At times, however, it felt like the camcorder had a difficult time keeping up with us. Taking video of stationary objects was better, though it wouldn't remain focused indoors or in low-light -- anytime we breathed, let alone moved, the lens needed to re-focus. On occasion we noticed brief periods (read: less than half a second) in which certain parts of the viewfinder would go dark. There is much rejoicing in the recent disappearance of the MotoBlur name, and we were incredibly relieved to boot up the Droid 3 and not be required to sign in or register for Motorola's UI experience. Rather, the currently-nameless user interface on the Droid 3 was a breath of fresh air, though it, too, has some cons. The Droid 3 received a much-needed boost to Android 2.3, a feat that the others haven't yet accomplished (officially, anyways). Motorola chose to throw in a few stock Gingerbread elements, but it's easy to spot a good deal of customization scattered layered on top of the OS. Here, you navigate the app tray by swiping left or right, and you have the option of filtering apps by groups (a long-press of an app results in the choice of sending it to the home screen or attaching it to one of those groups). 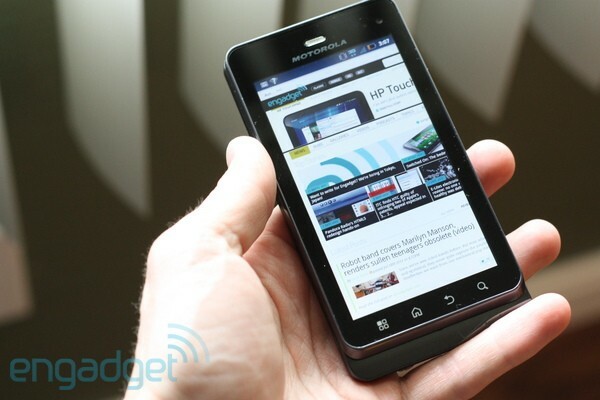 Motorola also threw in its own keyboard and dialpad, but opted for the stock music player and browser. Other than the app tray, most shortcuts remained the same, with one refreshing exception. We discovered that pressing the home button twice from the main screen panel would take us directly to an app of our choice. We were able to change it to one of several different apps just by finding the option in the settings menu. We were greeted by the same bloatware we've come to expect with any Android device on Verizon's networks: the usual VCAST suite, as well as Let's Golf 2 (did anyone ever play the first one? ), MOTOPRINT, GoToMeeting, QuickOffice, NFL Mobile, Slacker, and some proprietary social networking apps. As always, there's no way to get rid of these apps, so you just have to get to work hiding them from your usual viewing routine by grouping them together and using your own customized groups as a default. As far as performance goes, the Droid 3 is full of hits and misses. For a dual-core CPU, it performed without any lagging, per se. However, we grew impatient of the countless animations Motorola threw into its UI, each one taking at least two to three seconds to complete before moving on to the requested task. Examples include lengthy in-and-out transitions between menus, extra time to access shortcuts (such as the home key long-press and double-press), and opening up programs like the phone and Market. We know, we know, this sounds incredibly picky, but the fact is when using the phone throughout the day, 2-3 seconds for each transition eats up a lot of unnecessary time. The phone's hardware still functions admirably, but the UI effects are somewhat frustrating. Update: the animations are turned on by default; fortunately, the phone has a setting in which the animations can be turned off, which does trim down the transition time. In our benchmarking tests, Quadrant scored 2324; Linpack processed at 44.076 MFLOPS (single-thread) and 66.378 MFLOPS (multi-thread). Nenamark 1 came back at 46.4fps, and Neocore offered a whopping speed of 58.2fps. Sunspider results were just a smidge over 4000ms (4091, to be exact). There was just one matter of curiosity that we couldn't quite explain: whenever we attempted to run the Nenamark 2 benchmark on the Droid 3, it froze. Every. Single. Time. Restarts, master resets, and app re-installs weren't able to resolve it. We can't draw any conclusions on this, since everything else ran perfectly fine, but we're definitely stumped. The Droid 3 comes with a 1540mAh battery, but you'll definitely want a charger if you're away from home longer than a few hours. In our standard rundown test (we start at 100 percent and loop video endlessly until the battery dies) the phone lasted for 4 hours and 15 minutes. Our everyday use tests fared better -- we got nearly 10 hours of juice out of it when pushing emails, social networking, doing a moderate amount of web browsing, and taking pictures and videos. Still, we'd like to get a full day's use out of our smartphone if possible, though at least this would be long enough to cover a standard eight-hour workshift. Trying to live up to a good name is a heavy responsibility to take upon ourselves, and smartphones aren't any better off, either. Such is the burden of the Droid 3, being slapped with the duty of impressing the masses to the same degree as its original namesake. Sadly, it feels as though the latest rendition of this tune is more of a swan song. It's had a good run, but the Droid series seems to be fading. By no means are we suggesting this will be the last of its kind -- only Verizon and Motorola can truly answer that question -- but instead of seeing the same elegance, poise, or confidence exuded by the series' firstborn, we see yet another blocky phone. Looks aside, we enjoyed its dual-core performance, though it's somewhat inhibited by UI effects. Given the curious timing of the Droid 3's arrival paired with the Downy-soft launch, we're left to wonder what happened to it. Was it pushed out ahead of its pre-arranged time, its marketing dollars set aside for a much more hype-worthy Motorola Droid Bionic or Samsung Function launch? The Droid 3, with its top-notch keyboard and high-end specs (save for its 3G radio), is a phone we wouldn't mind using on a regular basis, but we're sensing something grander lurking just beyond the horizon.